Welcome to our year-round vacation land with outdoor adventures and enjoyment for all ages. Grab your hiking boots and your camera and get ready to explore! Inside are 2-bedrooms with double bed, two twin beds, bath with shower, carpeted. Outside is a deck with a fantastic lake view, plus lawn furniture and a private dock. Equipped for light housekeeping. Cottage amenities: stove, refrigerator, toaster, microwave, coffee maker, utensils, pots and pans, dishes and all bath and kitchen linens. We are only 2.5 miles from the Canada border! In addition to our Spruce Haven Cottage, we have 9 other rental units and a campground. Our lakeshore cabins are well spaced for privacy too. Our gift shop offers a wide variety of unique gifts, groceries, ice, gas, bait, tackle, and licenses, and a laundromat just steps from our main lodge. Poplar Lake is your backyard, so bring your boat, or use one of ours! We provide complete and partial outfitting services from our base on Poplar Lake. Cabin time here means having fun fishing, boating, hiking, and fishing... and more fishing. Rent a canoe and paddle around Poplar Lake, or into the Boundary Waters for a day of fishing. Keep your rod up! Walleye, lake trout, smallmouth bass, northern are abundant around here. We are a premier destination for snowmobiling thanks to reliable snow depth from December though March. Ride from groomed trails to your cottage door. * 60 - day notice required for refund. * $50 service charge applies to all cancellations. For cancellations within 30 days of arrival, we offer a refund only if we are able to fill the entire cancelation. No other refunds possible. Due to our small size and remoteness, cancelations significantly affect us. To avoid any misunderstanding, you will be charged for the days you reserve. Please check your dates carefully. 10% Discount for both Honeymoon and Golden Age are available anytime. Children 3 years and under stay free. Michelle Alexander Peterson — 5 star. My husband and I along with our golden retrievers have been coming to the Gunflint Trail for more than 15 years. 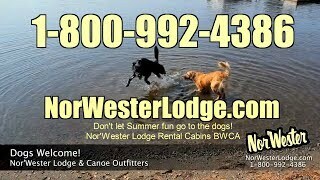 We have stayed at many places, but our favorite has been Nor'Wester Lodge! They have the best swimming beach of any resort and I love to swim. The cabins are all right on the water except for Balsam which is just up a short hill with a beautiful lake view. Matt Sweetman — 5 star. I've been staying at the Nor'Wester for 17 years. Beautiful place, wonderful people. Can't wait to go back. Thanks Carl and Luana! Christina Lynn— 4 star. Very nice people and lodge to stay at. Took your concerns and addressed them! Treated u like a friend.